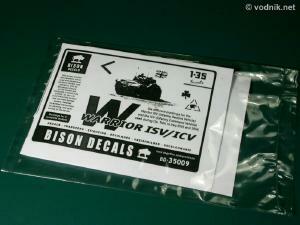 BD-35009 is a third decal set from Bison Decals for British armor used in Operation Telic in Iraq. 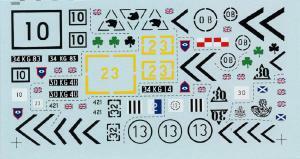 Previous two sets provided markings for Challenger 2 tanks, this one is for Warrior infantry fighting vehicles. There are markings for six vehicles included in the set - five of them are for regular Infantry Section Vehicles, while the sixth one is Infantry Command Vehicle. To make a model of ISV you can use Warrior MCV kit from Academy (preferably in just released updated Iraq 2003 version), but to build ICV you would need conversion set from Accurate Armour. Like other Bison decals sets, this one is also packed in a heat sealed plastic bag with a small decal sheet (70 x 130mm) and folded instruction sheet inside. Instructions are printed (or photocopied to be exact) on one side of a single A4 paper sheet and folded in such a way that one quarter of the sheet becomes a "cover" illustration for the set. As no decal numbers are printed on the decal sheet itself, there is a decal placement diagram printed in instructions. 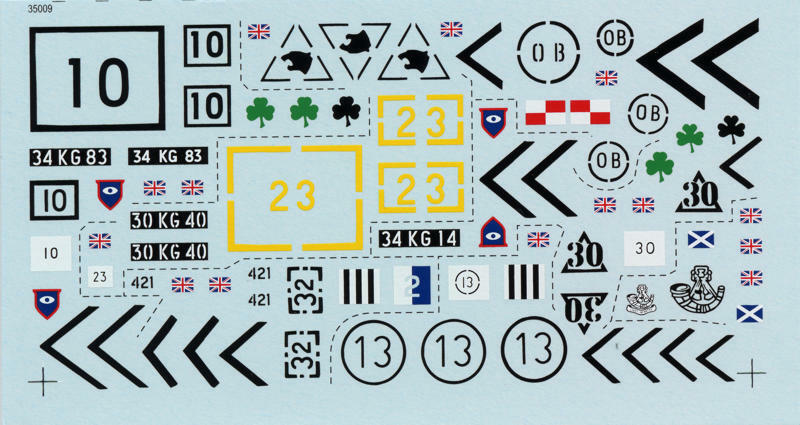 Instructions are quite clear regarding the placement of decals and include a list of references (mainly Internet addresses) and dimensions of fascines carried by one of vehicles, which allow you to scratch build them. Decals were printed by Microscale and are up to usual quality standard offered by this company. There are no color register problems and details are finely printed. Decal film is very thin and glossy. As with other Microscale printed decals, also here the use of their Set and Sol decal setting solutions is recommended. - standard British bronze green / black camouflage with overall bronze green additional Chobham armor. - desert yellow color, this vehicle carried fascines. In instructions you can find information about various additional equipment and stowage carried by featured vehicles, like stowage boxes and placement of combat ID panels. I found photos of a couple of Warriors featured in the Bison set. For example ICV vehicle (option C) is the very famous one, as the photo of it crushing big roadside portrait of Saddam Hussain was very popular. Another vehicle of which I have photo is the one with fascines (option F). For both mentioned vehicles all markings visible on photos are accurately reproduced on Bison decals. I cannot be sure if markings for other sides of those vehicles than those shown on photos are also accurate, but they seem generally correct. The same is true for marking options for which I don't have reference photos. There is a number of extra decals included in the set, which according to instructions are not used for any of six options. There are three spare Union Jacks, two Saltires (Scottish flags), two light infantry insignias and one Irish Guards Shamrock. Nicely printed decals with perfect color register. actually not used for any of six featured vehicles. 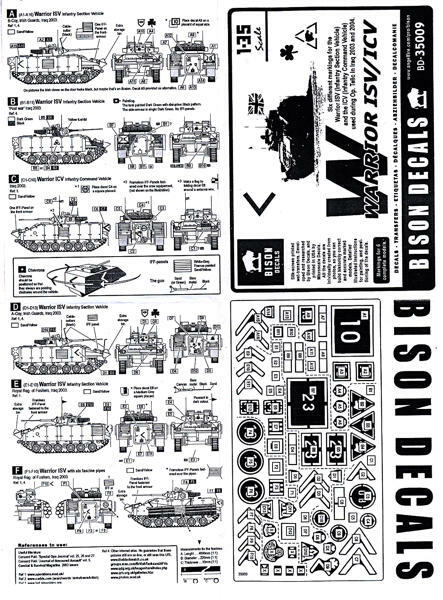 This is probably the most useful of three Operation Telic decal sets released by Bison. Two previous sets, while also useful, were not really essential, as two available plastic Challenger 2 kits in desert versions already had some Op. Telic markings included. Until now however the only available Warrior model from Academy came with old Gulf War 1991 markings and some Telic markings were needed on the market. Just a few days before I wrote this review Academy released updated version of their Warrior kit, with new parts and decals for current war in Iraq. But no reviews of this new model are available yet, so at the moment of writing this text it is impossible to tell what marking options are provided. Those shown on pictures on Academy website look very basic compared to Bison offer and I'm sure Bison decals would still be a perfect addition to new Warrior kits.